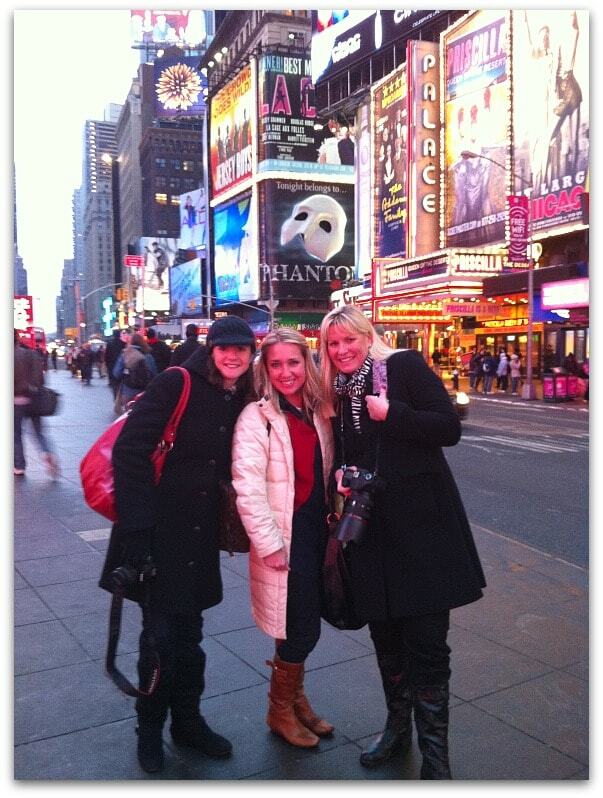 A couple of weeks ago, I hit the streets of New York City with my sweet blogging friends Maria, Jenny and Amanda. 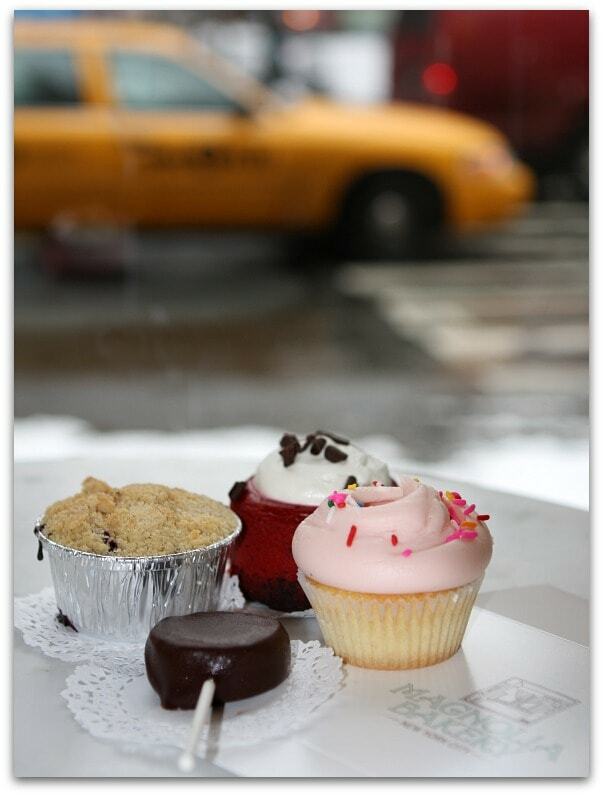 We pounded the pavement looking for every bakery in the city, tasting many delicious treats along the way. The girls are in Alice’s Tea Cup, where we drooled over their much-talked-about scones. 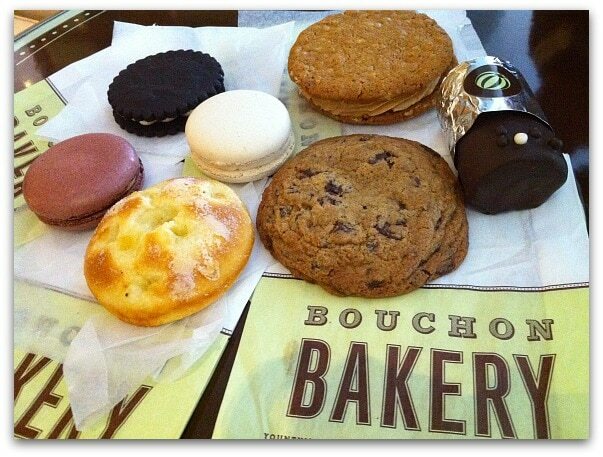 Bouchon Bakery was one of our favorite places… we sampled a Ho Ho, Vanilla Macaron, Peanut Butter & Jelly Macaron, Homemade Oreo, Peanut Butter Cookie Sandwich, Chocolate Chunk Cookie and some kind of pastry. 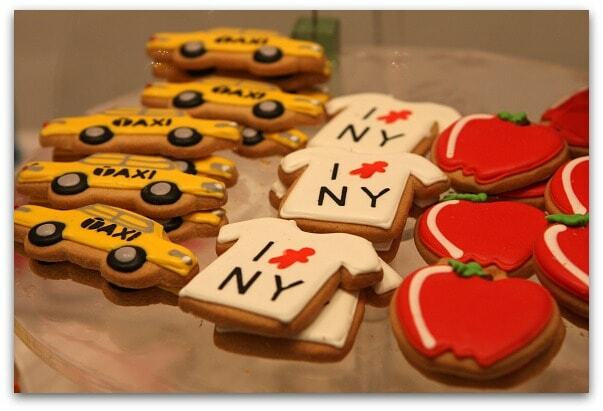 One of these delicious goodies was my favorite of the entire NYC trip… but you’ll have to scroll to the end of this post to find out which one it was! 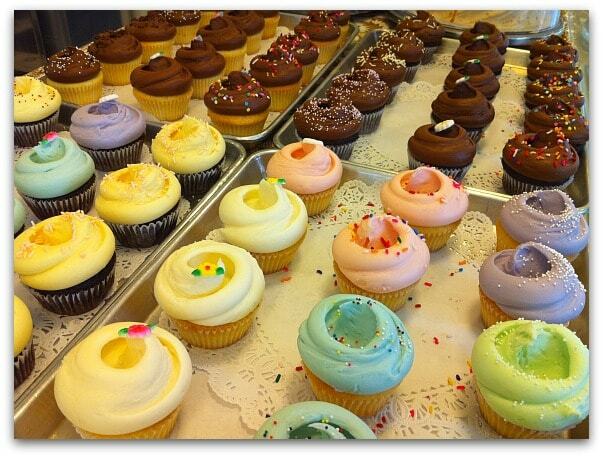 Of course, we had to hit Magnolia Bakery and check out their infamous cupcakes. Here are the treats we sampled at Magnolia. The cupcakes were quite good, but my very favorite was the Red Velvet Cheesecake- pretty much to-die-for. 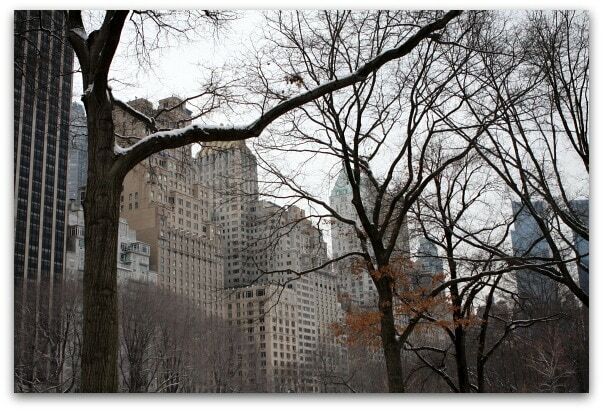 We cruised through snowy Central Park. Here’s Jenny, Maria, me and Amanda. This photo is courtesy of Amanda. I am SO not a big-city-girl, but it sure was pretty. Levain Bakery was our next stop- another fun one! The cookies at Levain are as big and thick as scones. 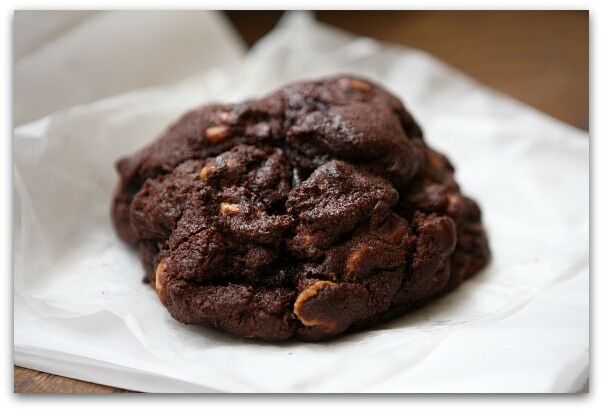 Bobby Flay did a Throwdown here with their Chocolate Chunk- Walnut Cookie (and lost). We sampled that one, as well as this Chocolate- Peanut Butter Chip Cookie and Brioche with Cinnamon Butter. All very good! Photo via Amanda. Good thing we walked a lot… all of that sampling, you know?! We wandered into Buttercup Bake Shop and gazed at their hot pink glazed and rainbow-sprinkled donuts, but we were too sugar-dazed at that point to try anything there. 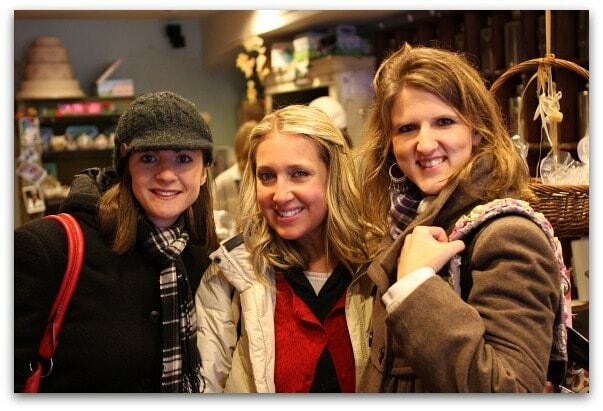 Next we headed to Patsy’s for some pizza, and we met up with our dear blogging friend Maggy. Momofuku Milk Bar was our next stop. 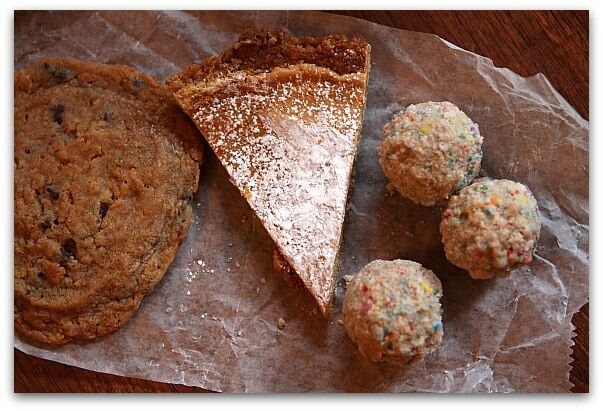 Here we tried compost cookies, crack pie, birthday cake truffles and cereal milk ice cream. All really interesting treats, but no real stand-outs for me there. Photo via Amanda. 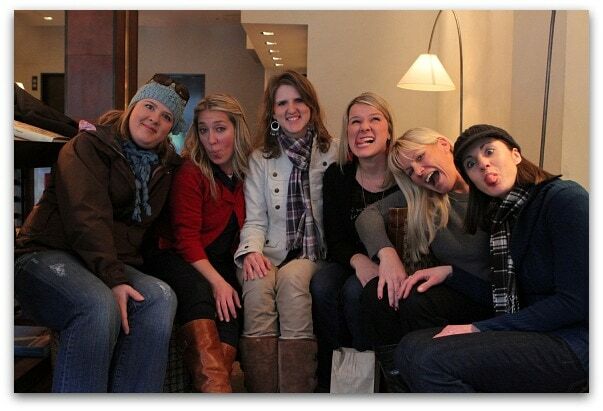 We did enjoy our time together upstairs in the Momofuku Lounge… girl gossip, blog gossip and just plain fun. 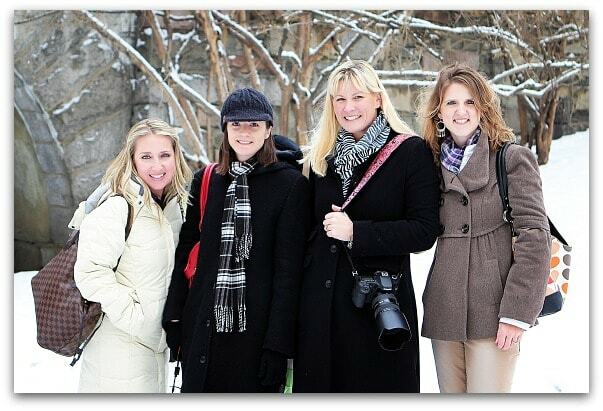 Left to right: Susan, Jenny, Amanda, Maggy, me and Maria. The real purpose of our NYC trip was to attend a VIP luncheon at Butter Restaurant in NoHo, hosted by the folks at I Can’t Believe It’s Not Butter. They announced that Kim Cattrall was going to be the spokeswoman for their new campaign. Kim spoke at the luncheon, shared her experience with the brand so far, and talked about filming the new commercials down in Latin America. 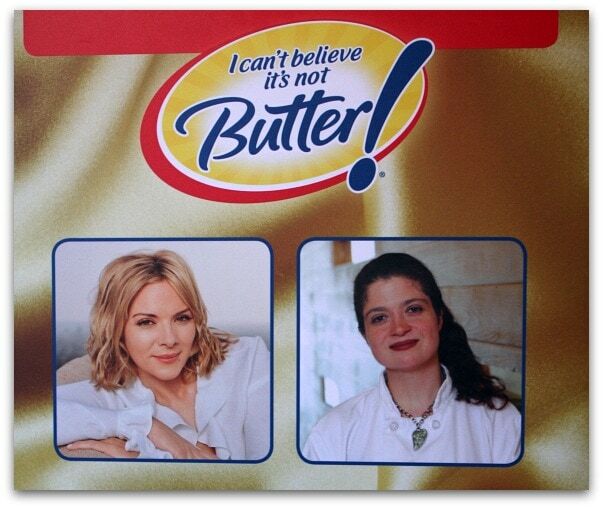 Actress Kim Cattrall, left, and Chef Alex Guarnaschelli toast the launch of the new I Can’t Believe It’s Not Butter “You Can Have It All” campaign at Butter Restaurant, Wednesday, Jan. 26, 2011 in New York. (Jason DeCrow/AP Images for I Can’t Believe It’s Not Butter). Guarnaschelli is the chef at Butter Restaurant. You may recognize her from Food Network’s Alex’s Day Off. She sat and talked with all of us bloggers for quite a long time and we found her to be extremely gracious, down-to-earth and hilarious. The food she served at the luncheon- Unbelievable Biscuits, Buttery Grilled Shrimp with Tomatoes, Crustless Quiche with Goat Cheese and Scallions, and I Can’t Believe It’s Not Butter! Cookies (all made using I Can’t Believe It’s Not Butter in place of real butter) was all fabulous. Gina and Jenny. 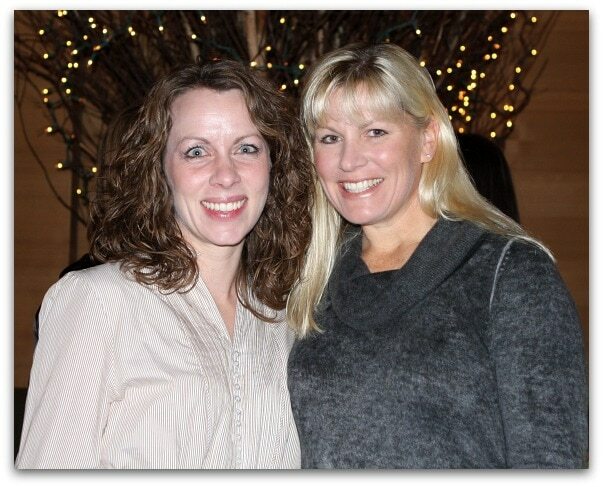 Gina and I have talked for a couple of years now on Twitter, and finally we meet! She’s another one who is exactly as I expected her to be… so pretty and fun and completely real. I visit her Skinny Taste recipe quite often in my lifelong quest to be skinny. Jenny doesn’t live far from me in Southern California, so she’s my lunch buddy on occasion. I just love this girl. 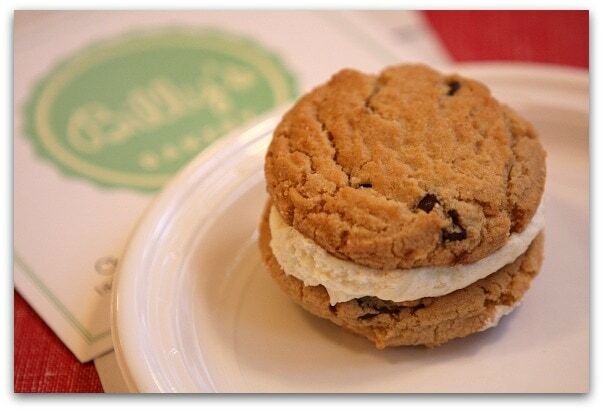 We found Chocolate Chip Cookie Sandwiches at Billy’s Bakery. And Cinnamon Marshmallows at Three Tarts. 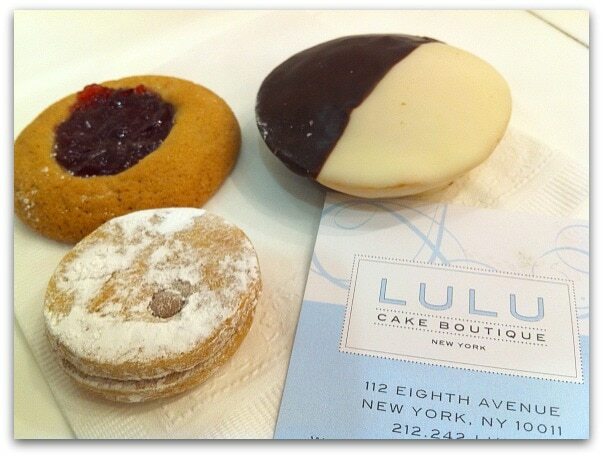 Lulu’s had Alfajores, Black & Whites and Raspberry-Filled Snickerdoodles. If I wasn’t so stuffed, I’d have tried their White Chocolate Dipped Red Velvet Twinkies too. Amanda found a rather decadent Double Chocolate Cupcake at Two Little Red Hens. 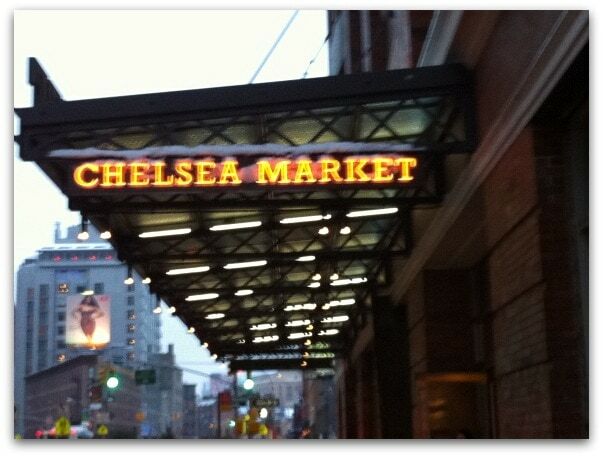 This was my very first time visiting Chelsea Market. 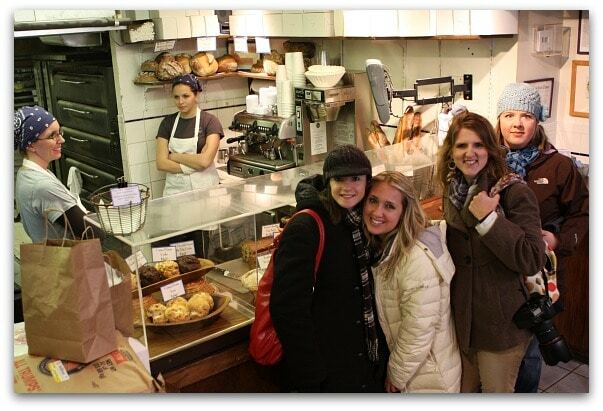 It really is a must-see for food lovers- gourmet shops and bakeries of every kind. 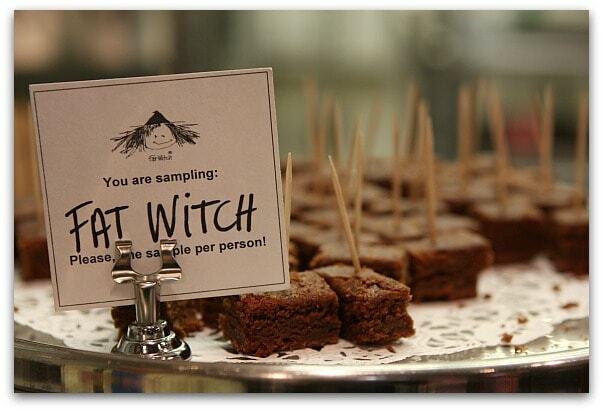 We sampled the original Fat Witch Bakery brownie… which I thought was just ok. We wandered into Jacques Torres, where Jenny picked up a hot chocolate. Eleni’s was next… all kinds of cupcakes and cookies. I thought these were cute. There were frosted cookie samples out so we nibbled… and they just tasted like frosted cookies. SaraBeth’s is also in Chelsea Market– didn’t get anything there but everything looked delicious. At Ruthy’s Bakery we ordered up a slice of New York Cheesecake. The cheesecake itself was amazing, but we wondered where the crust was. Why would they leave the crust off? Isn’t that the best part sometimes? 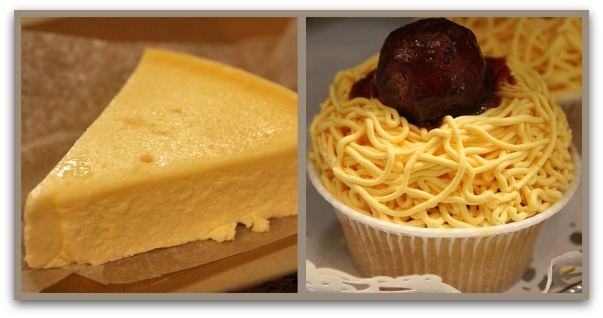 And I just thought this Spaghetti & Meatball Cupcake was adorable. I haven’t spent much time in the big city, so I was mesmerized by all of the bright lights of Times Square every time we walked through. Here’s Maria, Jenny and me. 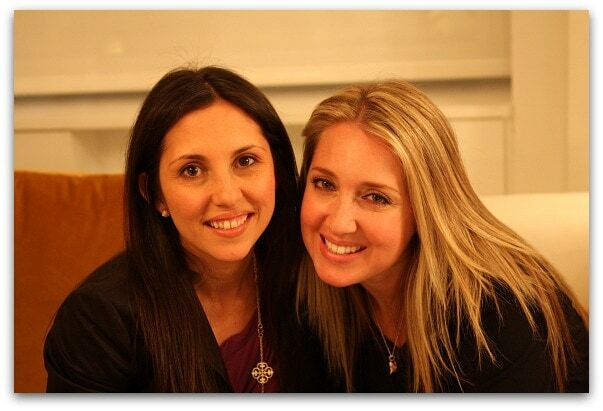 I’ve known Maria for a long time… seems like we’re always showing up at events and conferences together. Maria is just plain funny. She cracks me up. She always looks completely adorable, no matter what she throws on. I don’t know how she stays so skinny with all of the yummy cookies she features on her blog. One of our dinners was at Serendipity. 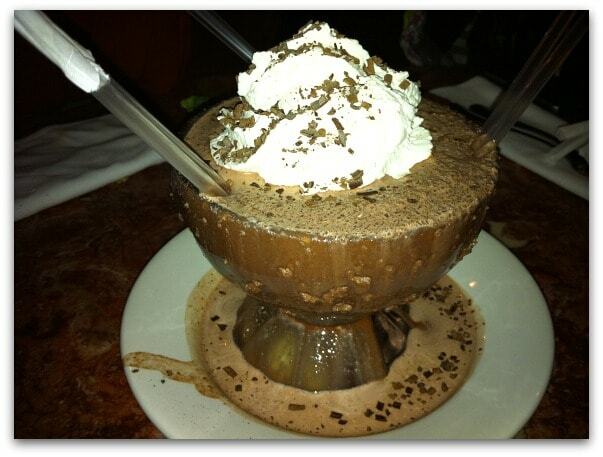 I just got a salad (you understand why…), but we ordered their infamous Frozen Hot Chocolate for our table to share for dessert. It was kind of like a hot chocolate blended with ice. I didn’t think it was such a big deal… but the chocolate-lovers at the table seemed to like it. Photo via Amanda. 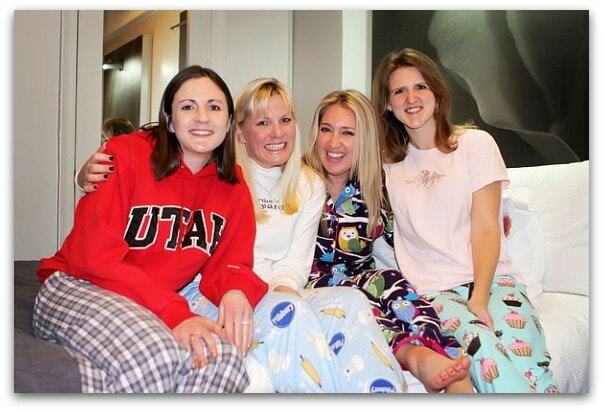 No blogger trip is complete without a pajama party, right? Here we are in Amanda’s room on what we thought would be our last night in NYC. 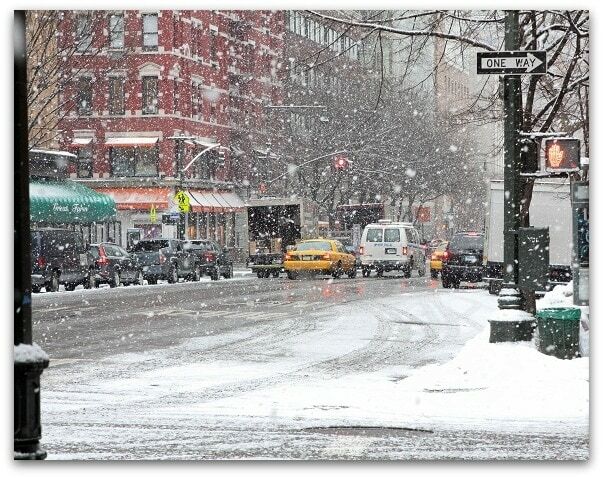 It snowed so much though that some of us were stuck there for another day or two (which meant more bakeries!) Special thanks to Amanda, who was the gal who found us all of the NYC bakeries and helped navigate our way through the big city. Amanda is a sweet Southern girl with a sweet tooth larger than anyone I have ever met. 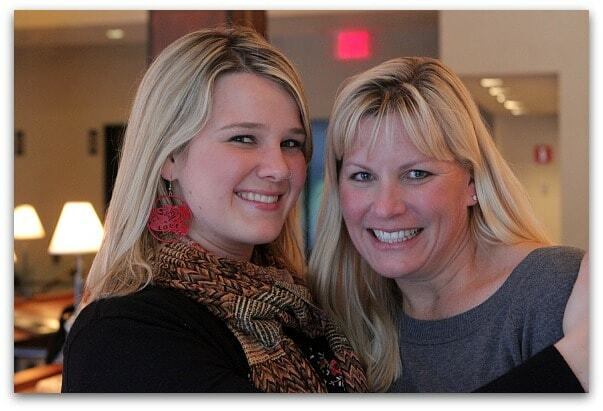 She’s someone you’d love to hang out with- I had a fabulous time touring bakeries in San Diego with her as well. Photo via Amanda. And my favorite dessert of the whole bakery tour…. 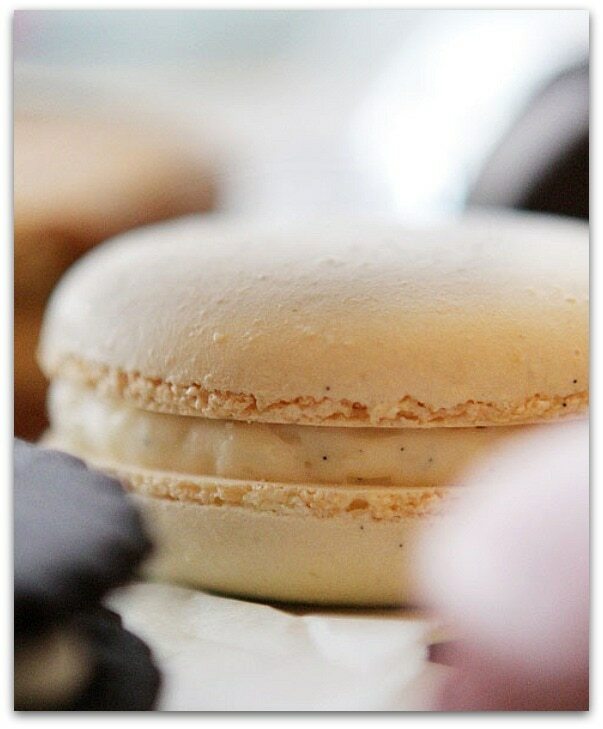 the Vanilla Macaron from Bouchon Bakery. It was simply the best little treat I’ve had in a very long time… so soft and tender and the filling was melt-in-your-mouth delicious. If I ever have a hankering to make macarons, I will most definitely attempt these. Hope you enjoyed the NYC tour 🙂 All of that, and would you even believe that I lost two pounds that week?? Small tastes and daily hotel workouts were my secret… and a bit of city walking too. Disclosure: My trip to New York City was sponsored by I Can’t Believe It’s Not Butter. I was not compensated for writing this post, and all opinions are my own. How fun. Love your blog, love you. I love it when I find new foodie friends. I am so glad I stumbled across your blog. I love it. I know I’m a little late to the party on commenting on this entry, but how precious! 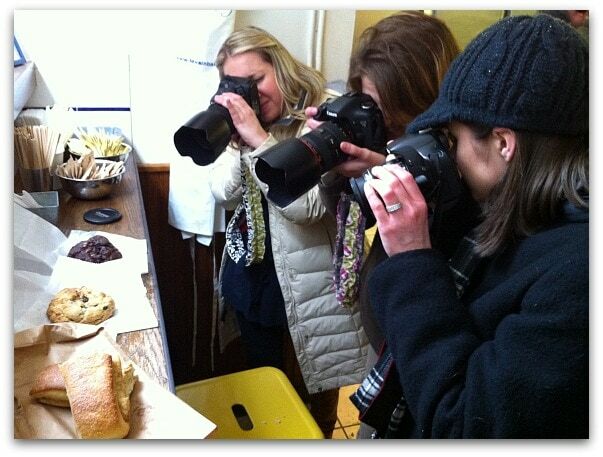 I can only hope to someday make a bunch of foodie blogger friends. 🙂 Thanks for sharing!